The new plan promises 1,400 new secured market rental homes, 1,400 new non-market homes (i.e. social and co-op housing), and 4,350 units of "more affordable ownership options," all within the next 30 years. A contentious community plan for Vancouver's Grandview-Woodland neighbourhood has been approved after a lengthy, heated debate at city council. Council heard from more than 70 speakers in a 12-hour session on Wednesday before debating and ultimately approving the plan in a three-hour session on Thursday. The new plan promises thousands of units of social and market housing and "affordable ownership options" within the next 30 years. Also included in the plan is a commitment to retain the unique character of "The Drive" — Commercial Drive, which runs through the heart of the neighbourhood. 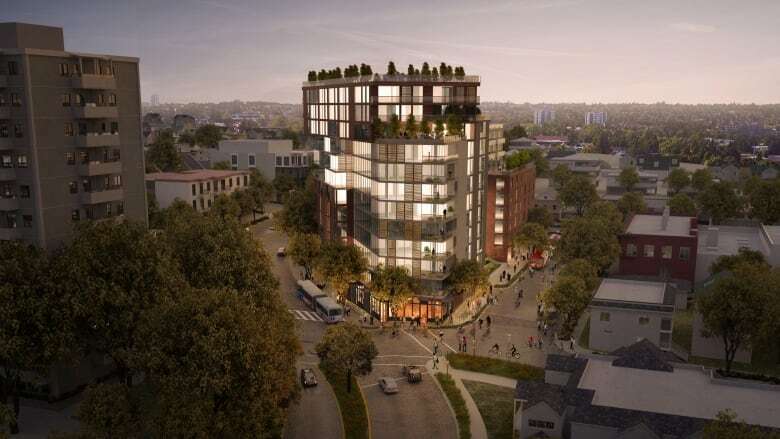 A controversial part of the plan is the Kettle Boffo project, at the corner of Commercial Drive and Venables Street. The project will include 30 units of supportive housing and 200 units of market housing. The project will proceed as a 12-storey building under the newly approved plan. Coun. Adriane Carr said relying on developers for social housing is a dangerous precedent. "We're talking about a lot of density to enable a developer to provide social housing and a social facility, when really that is the government's job to do that," Carr said. "If you rely on developers, they will absolutely demand more density and more height to be able to fund that development." But Coun. Kerry Jang, a mental health professional before entering politics, spoke forcefully in favour of the development. He said the Kettle Society has been struggling for years to get funding from higher levels of government to no avail, and the new development is needed as soon as possible to provide much-needed mental health services. "Coun. Carr was trying to scuttle the entire project by proposing four storeys, which would not make the project viable," Jang said. "She just didn't seem to care about people with mental illness, and that's why I got very angry, is because we heard from patients and clients alike how important it was. She ignored that completely, trying to give in to a few NIMBYs." Carr said she's also worried about the effect the plan will have on the numerous low-rise apartment buildings in the neighbourhood. Many areas that top out at three storeys have been rezoned to allow six, which Carr says will adversely affect one of Vancouver's best stocks of affordable rental housing. "You could see the replacement of those buildings instead of the retention of them and the upgrading of them, and we will lose affordable housing, and we can't afford to in this city," Carr said. Carr also said the plan needed further public consultation before approval, citing requests from MP Jenny Kwan, MLA Shane Simpson and the Grandview-Woodland Area Council. But Jang said the plan has already been through an "unprecedented" amount of consultation with the community, and that most people who spoke to council before the debate spoke in favour of the plan. The Grandview-Woodland Area Council echoed Carr's concerns, and said it was "extremely disappointed" about the approval of the Kettle Boffo project at 12 storeys.